Gavin Jackson (l) speaks with Post and Courier reporter Andy Brown on Monday, March 5 2018. 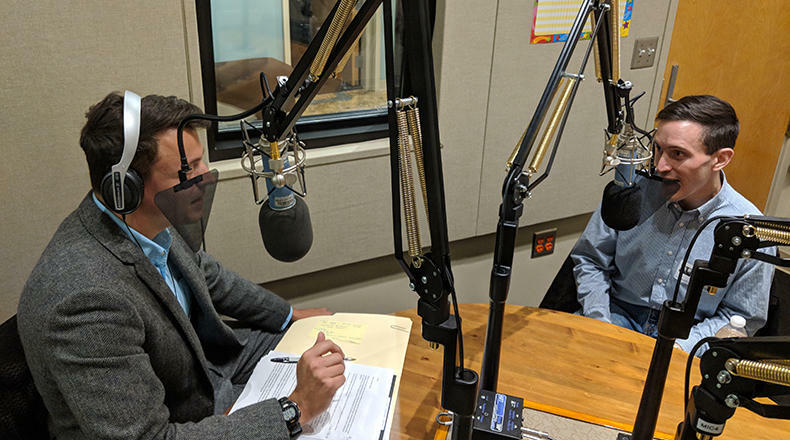 On this edition of South Carolina Lede, host Gavin Jackson is joined by Post and Courier statehouse reporters Jamie Lovegrove and Joseph Cranney to discuss the variety of gun-related legislative proposals currently before state lawmakers. On this episode of South Carolina Lede, host Gavin Jackson is joined by reporters Andy Brown and Andy Shain of The Post and Courier to discuss the sentencing of former state Rep. Rick Quinn, Jr. (R-Lexington) to two years of probation as part of the ongoing the statehouse corruption investigation. Quinn also will have to complete 500 hours of community service and pay a $1,000 fine. We also look at the latest news coming out of the state legislature regarding the V.C. Summer nuclear project and more!